Copyright © 2011 Mednansky Institute, Inc. In An introduction to the study of experimental medicine, Claude Bernard remarkably described 'the experimental method'. He particularly defined 'the absolute principle' of the experimental method and 'the experimental truth'. The absolute principle is the determinism of phenomena, in Bernard's own words: "Indeed the absolute principle of experimental science is conscious and necessary determinism in the conditions of phenomena". The determinism of phenomena, i.e., the immediate cause of phenomena, is the only criterion which directs the experimenters. They know the necessity, absolute relations and conditions behind the facts they observe. Not all facts must be accepted; only definite, accurate and well-observed experimental facts generate experimental truth. The experimental truth is the foundation for experimental reasoning. It is founded on doubt which experimenters must maintain for it "leaves to the mind its freedom and initiative". If the mind no longer has freedom of action, it lacks, wrote Bernard, "the power to break away from that blind faith in theories which is only scientific superstition". In science the experimental method is dependent only on itself; it has taken the place of man's opinion. Experimenters in search for truth no longer defers to personal authority, they rely solely on experimental facts and, as Bernard emphasized, "in the experimental sciences, great men are never the promoters of absolute and immutable truths". Experimental science develops in laboratory. Do not substitute the authority of facts for the authority of books - warns Bernard echoing Descartes in admitting nothing as truth, unless clearly recognizable as such. 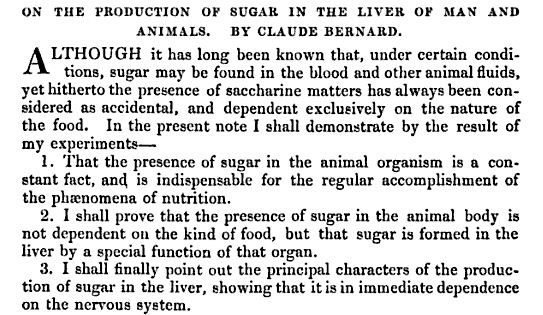 A genius in the field of physiology, Claude Bernard discovered the production of sugar in the liver of man and animals. However the accepted theory proclaimed animals could not produce sugar; vegetable matter did so for animal consumption. Consequently Bernard's clear and concise experimental demonstration of sugar production in the liver will not be accepted for some time by the Academy of Medicine. Bernard is also remembered for other major contributions to the field of physiology, the discovery of the vasomotor nerves, the action of curare and other poisons on neuromuscular transmission, the role of the pancreatic juice in digestion. He enlarged science by adding knowledge, both new facts and an exceptional account of the experimental method he applied to his investigations. His grandeur is revealed as he wrote in his Introduction, "One of the greatest obstacles to the free and universal movement of human knowledge is the tendency that leads different kinds of knowledge to separate into systems. This is not a consequence of things in themselves, because everything in nature is connected with everything else and nothing should be viewed in the isolation of a system; but the feeble yet dominating tendency of our minds leads us to absorb other kinds of knowledge into our personal system. A science that halted in a system would remain stationary and would be isolated, because systematization is really a scientific encysting, and every encysted part of an organism ceases to take part in the organism's general life. Systems therefore strive to enslave the human mind …" We must "promote conflicts which destroy them, by stirring and stimulating the vitality of science". 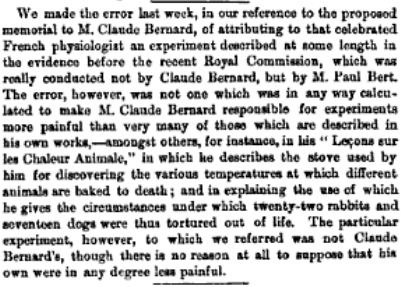 Note: Claude Bernard has been criticized on moral grounds for his experiments involving vivisection. 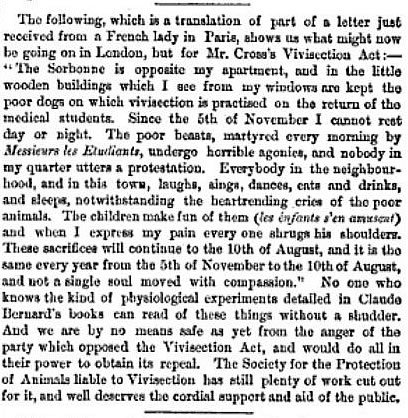 He devoted a full chapter to vivisection in 'An introduction to the study of experimental medicine'; he wrote "I do not admit that it is moral to try more or less dangerous or active remedies on patients in hospitals, without first experimenting with them on dogs; for I shall prove, further on, that results obtained on animals may all be conclusive for man when we know how to experiment properly. If it is immoral, then, to make an experiment on man when it is dangerous to him, even though the result may be useful to others, it is essentially moral to make experiments on an animal, even though painful and dangerous to him, if they may be useful to man". 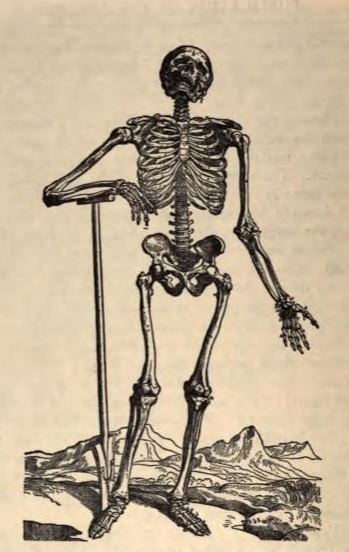 Justifiable as it sounds, was he - the truth seeker - 'driven sometimes into strange byways far off the road were you find truth' (as worded by Paul de Kruif in Microbe Hunters)? And, from this practice, was his heart made hard ('Shall from this practice but make hard your heart' Cornelius to the Queen in Shakespeare's Cymbeline)? His spirit may have been of pure science, and his mind free from further consideration for benefiting scientific knowledge. However -as Bernard Shaw's wisest people say- "If you cannot attain to knowledge without torturing a dog, you must do without knowledge", in The Doctor's Dilemma: Preface on Doctors, 2006. The Third Principle of the Nuremberg Code refers to animal experimentation as follows: The experiment [on human subjects] should be so designed and based on the results of animal experimentation and a knowledge of the natural history of the disease or other problem under study that the anticipated results will justify the performance of the experiment. Excerpt: "I have reached this point: the experimental novel is a consequence of the scientific evolution of the century; it continues and completes physiology, which itself leans for support on chemistry and medicine; it substitutes for the study of the abstract and the metaphysical man the study of the natural man, governed by physical and chemical laws, and modified by the influences of his surroundings; it is in one word the literature of our scientific age, as the classical and romantic literature corresponded to a scholastic and theological age"